Choosing the right type of window blind for a sliding door or large window can be a much easier choice if you know what is out there. The most common type of window blind for sliding doors is vertical blinds. 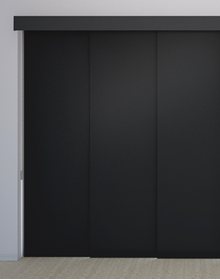 If you were to go inside every home in the United States, the majority of them would have a vertical blind installed on their sliding door. It comes down to functionality with a vertical blind. 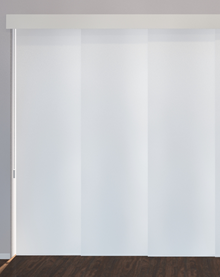 Since most sliding doors will open to one side, vertical blinds are perfect because they move on a horizontal track and can be slid all the way to either side. Another suggestion would be a panel track blind. This type of blind also operates and slides on a horizontal track. The difference is that it has large panels that have a fabric attached to them. In a vertical blind that panels are made of PVC and are very thin whereas a sliding panel blind has 3-5 panels only which are wide and have a fabric attached to them. Most people consider sliding panel blinds as a nicer option to vertical blinds. This might be due to the fact that you can choose they fabric that goes on your panels. Custom made Vertical Blinds at discount prices! Order your vertical blinds online today and save a lot of money. We also have blackout vertical blinds and sliding blinds and sliding shutters. If you are looking for vertical blinds faux wood look, we also sell those that are often called leisure wood blinds. Are you looking for outdoor blinds for your patio doors? We have the best window blinds for both interior and exterior use. Furthermore, we have for purchase vertical curtains that will look great in any home or house and come in an assortment of colors like white, ivory, blue, gray, black, red, pink and others. We also have them in custom sizes for extra large windows that include extra wide and extra long openings. Window vertical blinds can also be turned into panel curtains in bamboo blinds for sliding glass doors because the fabric can be exchanged and give you many different options. Sheer up and down drapes can change the look of your entire home. And if you want the exact opposite you can get metal look vertical shades that give you a mirrored look that looks awesome in person. Check out these vertical blinds alternatives that include panel track blinds which are sliding panel blinds that can be made in any fabric like solar shades, blackout shades, bamboo shades and other patterend window blinds. 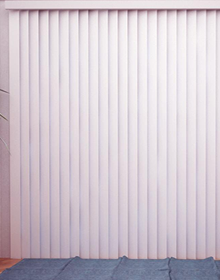 PVC Vertical blinds are made in 3 1/2" widths and are high quality. These are the cheapest blinds online because costs are low. Those are plain colored vertical slats but we also sell smooth and textured vertical blinds that include designs and floral designs. If you need fabric vertical blinds, they are also a great discount solution and are very light weight too. All of our hardware including the metal track are top quality and the valances come standard unlike other window blinds companies. 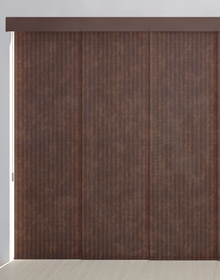 Patio door blinds can be made in custom drapery panels that appear unique and modern. If you are looking for cheap black blinds, these would be probably the lowest cost blinds online. Need to learn how to measure for vertical blinds or how to hang them? It's very simple, all you have to do is measure the width and provide the smallest of three measurements. For the height you would do the same thing in the middle, right and left and also provide the smallest size. And that's it, after that we will ship out your vertical treatments free of charge. No matter what vertical coverings you select you will be happy. Woven vertical blinds happen to be a new alternative that a lot of people are choosing. 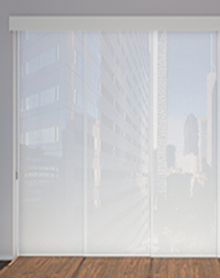 We are the best vertical blinds store online and can prove it with our quality and pricing. So stop asking yourself where to buy vertical blinds online and finally figure out that you are at the correct spot!